The Outfest Screenwriting Lab started as a screenwriting contest in 1997 and became the cornerstone of our education and mentoring program, Outfest Forward. Twenty years later, this program has become an intensive three-day lab where industry professionals mentor the next generation of screenwriters. After the lab, these writers work with experienced Outfest directors to present their screenplays on stage with a live reading at Outfest Los Angeles. 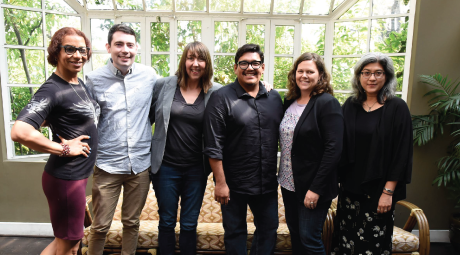 Screenwriting Lab Fellows will continue to receive guidance from Outfest Staff and Mentors for the full calendar year. Throughout its history, the Lab has shepherded 100 scripts through its mentoring program. The scripts from the lab have been: Opening and Closing Night films at Outfest Los Angeles, nominated for an Independent Spirit Award, premiered at Sundance, and one has even been selected as Peru’s official submission for the Academy Awards!